Colombia’s vaulting star Juan Martin Clavijo dominated the junior male individual class defending the title he won two years ago at the first ever FEI Junior World Championships. 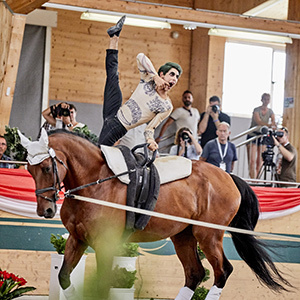 Alongside Sandra Tronchet and Quiece D’Obliche, Juan performed a final freestyle master class of his interpretation of Jared Leto’s ‘The Joker’ scoring an incredible 8,889 for the round – a score which would challenge in the senior division. Germany’s Gregor Klehe put on a strong show as he performed his Zorro freestyle to take the silver medal on Adlon lunged by Alexander Hartl (7,945). Philipp Stippel (GER) together with Sir Valentin 5 and Dina Menke rounded off the podium winning bronze (7,817). Jannik Liersch (GER) finished just outside the medals in 4th (7,755). The standard of the Junior male category over the past few years has seen a dramatic increase and with competitors from Switzerland, Italy, Russia, Austria, USA, Hungary, France, Slovakia Great Britain, Germany and Columbia all making the final 15 – it was truly an international affair. Nicole Brabec (AUT) captivated the audience at the Magna Racino in Ebreichsdrof, with her ‘Rio’ freestyle. Together with lunger Manuela Barosch on the experienced Royal Salut she took gold in the highly competitive junior female individual class scoring 7,990. Germany’s Franziska Peitzmeier with lunger Anna Brinkmann and Dorian Grey SN showed great strength to win her 3rd consecutive junior individual silver medal narrowly missing out on the top spot (7,910). Johanna Lindberg together with lunger Dusan Barci and Real Easy made history for Sweden winning them their first ever junior medal (7,831), and their first medal since they won bronze at the World Equestrian Games in team in 2002. In the Junior Pas de Deux class it was extremely tight at the top which resulted in a nail biting final. Austria’s Anna Krippl and Viktoria Feldhofer performed an outstanding Pas de deux to win the first gold medal of the Championships. Together with lunger Eva Maria Kreiner and horse Le Grand Chevalier they scored 7,938, receiving rapturous applause from the home crowd. Last year’s European Pas De Deux champion Julian Kogl teamed up with new partner Ronja Kahler on Daytona lunged by Lars Hansen. They pushed the Austrians to the very end eventually taking the silver medal on 7,824. The USA pairing of Janie Salisbury and Bridget Kiernan with horse Diva 506 and Carolyn Bland, delighted audiences with their rendition of ‘Singing in the Rain’ to finish 3rd (7,750). Junior Team Germany were untouchable in the squad competition leading throughout all three rounds. The team performed their Samba inspired routine to much appreciation from the audience and judges alike and together with Humphrey Bogart 6 and Andrea Blatz they finished on an astonishing total score of 8,130. The reigning Junior World Champions, team Austria, put on three great performances but were unable to match the seamlessness of their German rivals. Alongside Darwin and Karen Asmera they scored 7,579 to take the silver medal with Junior team Switzerland on Isabella IV and lunger Corinne Bosshard taking bronze on 7,555.